It is the unfilled dream of numerous people to work in Hollywood and eventually make it to the big screen, make millions of dollars and win over the hearts of thousands of fans. Even though this is a privilege reserved only for the lucky few who make it, the rest of us continue to imagine that we can maybe one day live the glamorous lives of the stars we admire. These daydreaming episodes tend to escalate during several events throughout the year. People follow these events with great interest because they can see the cinematographic achievements of their favourite stars and maybe witness Leonardo DiCaprio finally receive his first Oscar but we all know this isn’t going to happen any time soon. These prestigious events hold our attention for weeks and through the power of the Internet we get to talk about them all the time and recap again and again what happened in which ceremony. There is a reason we forget all about our problems and shift our attention towards the achievements of other people – through their success, we feel like we are succeeding. These awards give us validation on several levels – not only do we share the success of the people participating in them, but we also get to hear that experts share our opinions about certain movies. That being said, what are the most prestigious movie awards? The Oscars are possibly the single most important annual event in the history of cinema. Receiving an Academy Award is one of the greatest achievements in any actor’s career. However, even though most people focus mainly on the actors, The Oscars are also a testimonial for great directorial achievements, technical merits and many more. It’s not just the actors making the movies so it stands to reason they shouldn’t be the only ones getting the praise. The first ceremony was conducted in 1929 and lasted only for 15 minutes with 15 awards being granted. The winners had been announced in advance but this practice was changed over the years. One of the changes was giving newspapers the names of the winners in advance, with the condition to print the names at 11 PM in the night of the ceremony. The current practice of using sealed envelopes was introduced in 1941 because of the Los Angeles Times which had made an announcement with the names of the winners before the ceremony. Today there are 24 categories ranging from Best Actor/Actress in Leading/Supporting Role to Best Song and Best Costume Design. You can see the full list online. 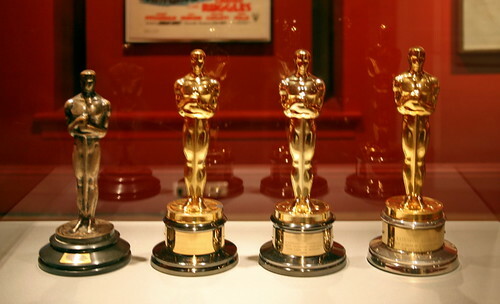 The Oscars are undoubtedly the most prestigious award but they are definitely not the only one. Golden Globe is another testimonial for great achievements in the area of cinematography. Unlike the Academy Awards, though, they are not granted exclusively for film accomplishments, but for television, as well. It is the second highest honor in entertainment after the Oscars. The 1st Golden Globe Awards were conducted in 1944 and celebrated the greatest achievements in cinematography from the previous year. The awards are organized annually in Hilton Hotel in Beverly Hills. They’ve been held there every year since 1961. There are currently 15 awards for films and 11 for television. The Emmy Award are for television only but since many people confuse them for movie awards, I decided they needed a mention here. The Emmy is the equivalent of the Oscars in television. Unlike most awards, though, the Emmies are have ceremonies throughout the year because they cover different areas, the most notable being primetime and day-time TV. The Emmies also cover news, sports, documentaries and many more. Still, like I said, they are not movie awards, so don’t get them confused. Be that as it may, some of the Emmy ceremonies get a lot of coverage. Jane Mires loves to write about cinema and movie awards. She currently works for http://www.shinylondon.co.uk/carpet-cleaning-willesden-nw10/ and in her free time she loves to watch movies.